Friday Cruise: 6:30 p.m. to 9:30 p.m.
Friday Registration: 12 p.m. to 7 p.m.
Saturday Show 'n Shine: 8 a.m. to 4 p.m.
Saturday Cruise: 6 p.m. to 9 p.m.
Saturday Registration: 8 a.m. to 7 p.m.
Read the 2018 Function 4 Junction Magazine Online, Click Here! 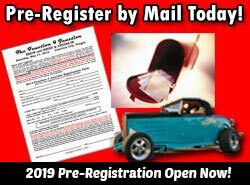 We welcome Cars and Trucks of all years, makes and models to enter in the Show 'N Shine, where awards are given for several vehicle categories. The evening downtown Cruise is open to 1974 models and earlier cars and trucks only. Details available on the entry form. We invite you stay in the Junction City area for the Function 4 Junction. For more information about local accommodations, click here. 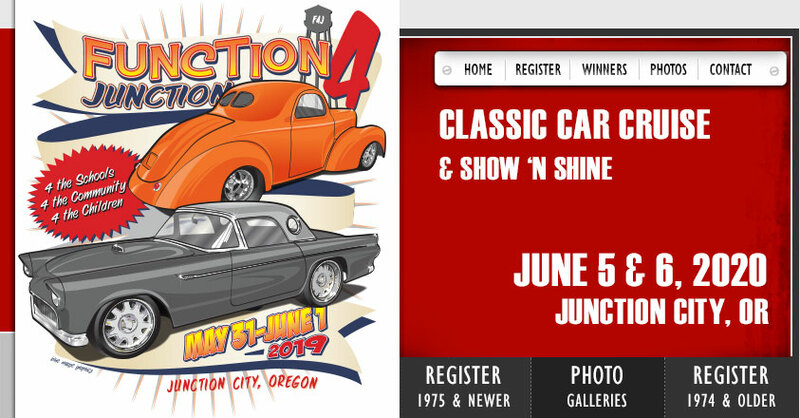 Join us in Junction City for the Function 4 Junction May 31 & June 1, 2019! On Friday night, newer vehicles cruise downtown from 6:30 p.m. to 9:30 p.m., and this year we are including 1974 and older classics to cruise Friday for an additional fee! 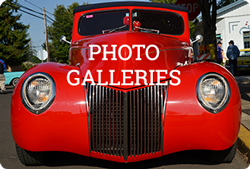 Saturday morning, the show 'n shine begins at 8 a.m. open to all makes and models of vehicles in downtown Junction City. Come in on Greenwood where the registration and parking line begins on Greenwood St. between 5th and 8th Avenues. In addition to the show 'n shine and cruise, there will be a 50/50 raffle, a quilt raffle, food booths, and much more! Saturday night, from 6 p.m. to 9 p.m. we will have a classics only cruise! The Function 4 Junction is a 501(c)(4) non-profit organization that raises money for the children, for the schools, and for the Junction City community through donations from local businesses, registration fees, and the work of volunteers. Each year we donate to local charities and award scholarships through the Education Together Foundation. If you or your group would like to volunteer to help, please call Corrie Lucas, F4J President, at 541-554-5809. Students needing community service hours for graduation are eligible to help. We stuff goody bags before the event, and during the event need volunteers to watch barricades, help with registration, sell raffle tickets, hand out flyers, distribute magazines, and more!